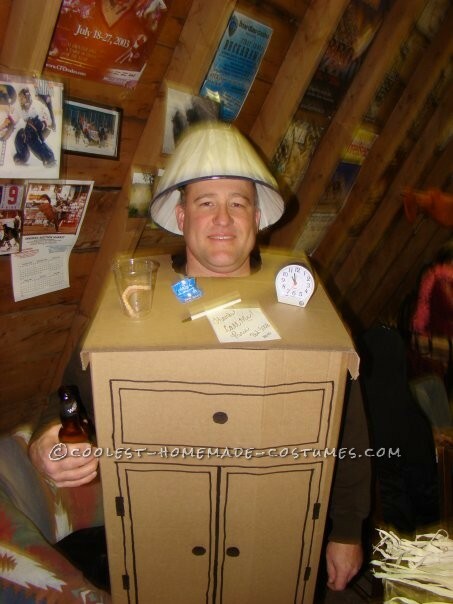 Well everyone has heard stories of the “one night stand” so I decided to do up my version of one super easy one night stand Halloween Costume. I took a reasonably large box and cut out a spot for my head and neck to stick through at the back of the top. Arm holes were cut into the sides so I could still eat and drink…….basically because who wants to go to a party and not be able to eat or drink right? Then I took a large, wide, black marker and drew on the front doors to the nightstand and a top drawer. I added a couple door and drawer knobs and the nightstand was complete. Next I glued a small alarm clock, a clear plastic cup, a condom wrapper, a pen and a note from the fictional chick I dreamt up (just think of who the current floozie is in the media and voila you got a one night stand!!). Inside the clear plastic cup I glued a set of false teeth which just adds to the ewwwwww factor right there. A quick trip to the local thrift store and I had the lampshade for my head and after removing the wire from inside the lampshade I was good to go! 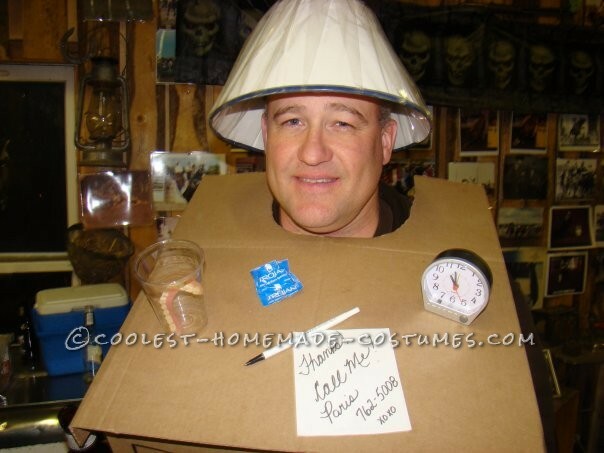 Pretty simple costume and guaranteed to get you some laughs, maybe even a one nighter!